There once was a young man who went off to war. At just 20 years old, with tears in his eyes, he kissed the girl he loved and left Chicago, destined for the shores of Europe and a battle so fierce it left him with wounds that cut to the bone and scars that forever changed his life. He spoke fluent German and was made an officer, leading his troops through tangled webs of barbed wire and across the dark and desolate battlefields, sodden with the blood of fallen soldiers. Whether from friend or foe, blood is blood. It congeals just the same, oozing into the muddy ground only to be picked up by the boots of the living, marching steadily toward their own graves. So is the saga of war. Menacing, like the black storm clouds that roll in quickly over the mountains. Suffocating, like the fog that envelopes the trees leaving only vague impressions of branches that sway in an unseen wind. In Italy, near the shores of Lago di Bolsena, he was captured. A prisoner for years, he was transferred from camp to camp across Europe, until, in Poland, he escaped. He traveled through the night, and desperately sought refuge with a sympathetic Polish farmer and his wife during day. 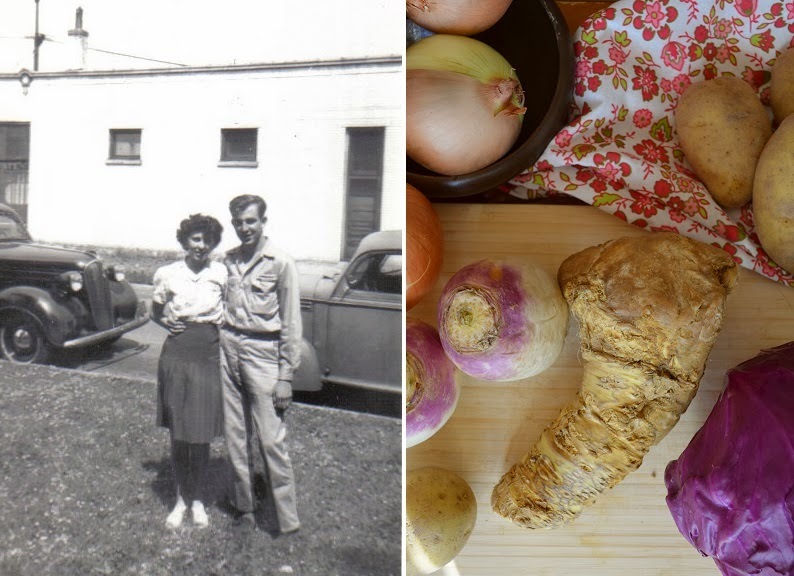 He hid among the turnips and carrots in their root cellar as enemy soldiers searched the farm house for escaped prisoners. One day they found him, beat him, and left him in a prison cell to die. But, lest you think this just a tragic tale of war, let me assure you that it is so much more. It's a story of courage and survival and of the food that connects the two. You see, human kindness stretches far beyond political ties, and this man was strong. Stronger than anyone imagined. He didn't die. And as the years stretched on, he befriended the prison guards, speaking to them in their native language and repairing their watches when they stopped working. In return, they brought him cigarettes and covertly slipped parcels of cabbage leaves tied with string through the cell bars. Like little presents, these cabbage leaves held a sweet surprise. Tiny bits of dark chocolate were hidden inside! On these he survived, and eventually the war came to an end. He was shipped back to America where he received a hero's welcome and a purple heart for his injuries. His wounds began to heal, but the scars ran deep, as all scars of war do. He was deaf in one ear from a muzzle blast that killed the man next to him, and the shrapnel in his leg was encased in bone, forever sealing it in a tomb of his own flesh and blood. He married that girl he loved. And life went on much as it did before the war. Like all soldiers, he carried the horrors deep within, though his gentle hands and soft voice concealed the constant pain. I never knew his story. He spoke of it to no one. Instead he made jewelry. Elaborate pieces of twisted metal and stone. Broaches, and pendants, and rings, engraved by hand in script so beautiful that you'd swear it was etched by the hands of angels. He liked his mashed potatoes lumpy and his coffee black. He made his own horseradish, so spicy it burned your sinuses and made you cry in both pleasure and pain. In the summer he'd tend his garden where, in neat rows grew cabbage, turnips, carrots, onions, and corn, so high we kids would get lost among the leafy stalks. On rainy days he'd pretend to be a pony, and hoist me onto his strong back, galloping on all fours around the house. 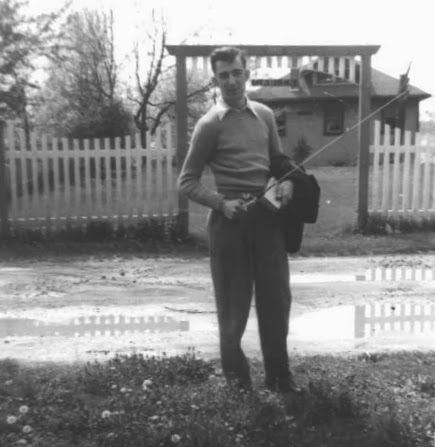 He drove fast, smoked cigarettes behind the house, and was always one for a good joke. He'd slap his knee as he laughed and his eyes crinkled almost shut. Some called him "Hero," others called him "Sir," many called him "Lieutenant," I liked to call him "Grandpa." It wasn't until he was very old that his war stories began to emerge. Like tiny bubbles rising to the surface of a boiling pot of water as the tension breaks, so too did his memories surface as his mental resolve - that force which had kept them hidden for so long - began to crumble under the strain of Alzheimer's. Some stories were shocking in the most horrific ways, some were questionably unrealistic, some brought tears to our eyes, and all were absolutely fascinating. He revealed them all on his death bed. 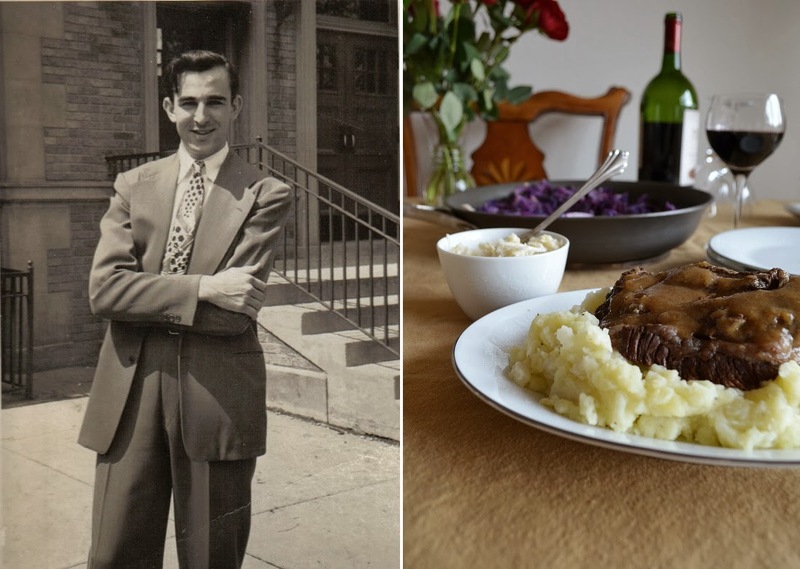 Through out his life my grandfather loved German food and my grandmother happily appeased him, making any number of German dishes. 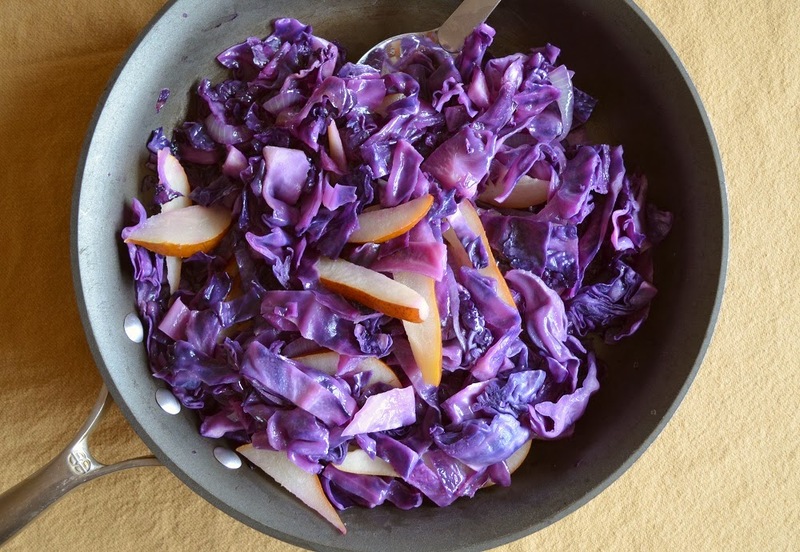 Cabbage and caraway seeds were common players in her kitchen. Sauerkraut and bratwurst, Sauerbraten with mashed potatoes and turnips, fiery horseradish from the garden, and dark chocolate torte with cherries. Perhaps, to him, they symbolized life. Though he's been gone for many years, I still feel the sting of missing him. On those days I like to get out my grandmother's old recipe box, throw on my apron, and settle into the kitchen. These recipes all came from her collection. She liked to write little notes on the tops of each recipe. "Too Spicy," or "Add Sugar," or Very Good!" or "Ed's Favorite." I think these notes were meant for me. So last week, when the weather was dreary and we were fogged in once again, I got out her cards. They say food unites people. 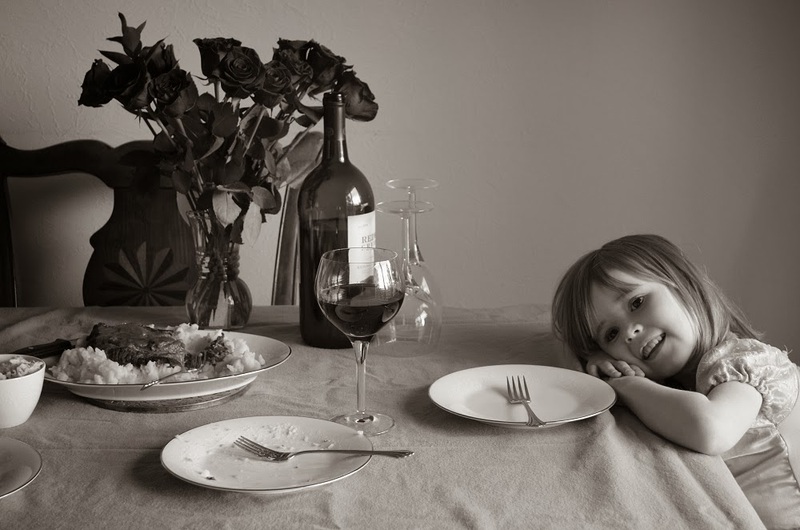 I say food unites us in death and life. 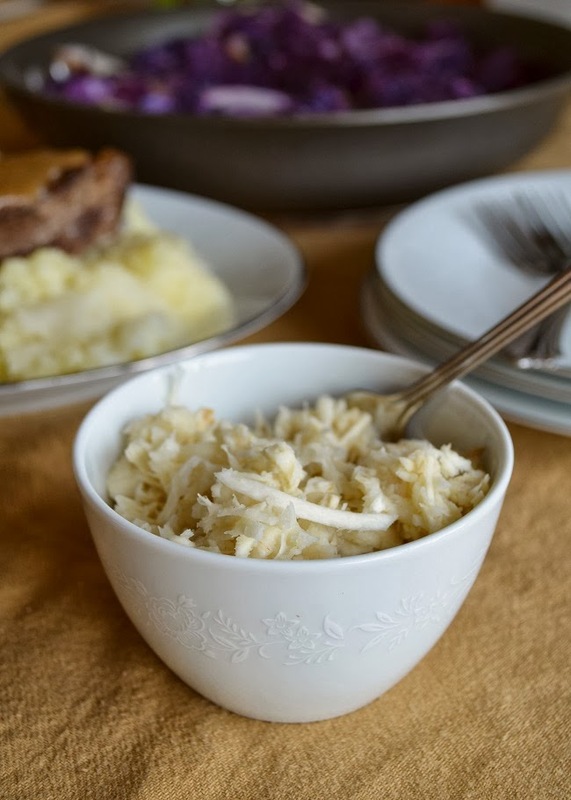 When I make these dishes I can almost feel my grandfather sitting across the table, placing a big dollop of spicy horseradish on the side of his plate. I can almost hear his laughter, so infectious, as one of the kids does something silly. And who's to say he's not? 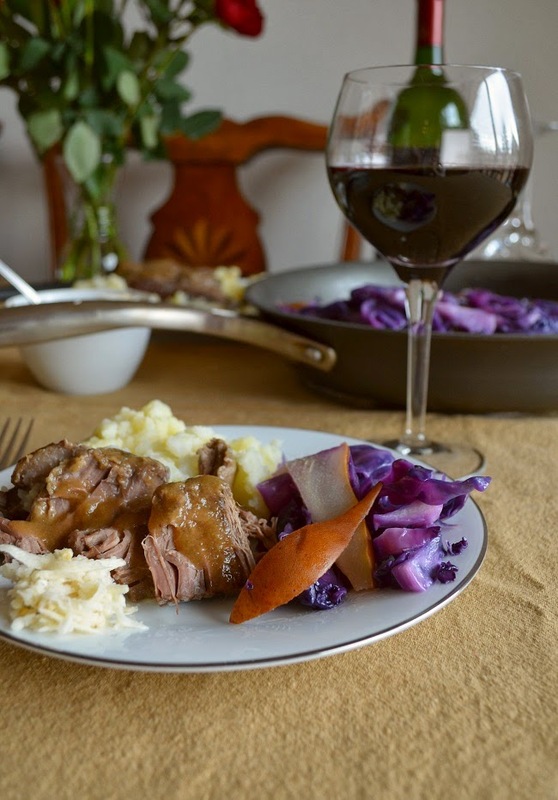 Sauerbraten is slow food at its finest. It marinates for 3 days in the refrigerator and then cooks for 8 hours in the crock pot. It's one of those special meals that you need to plan for. My grandmother always served it on Sunday afternoon. This means you have plenty of time to make the homemade gingersnaps which will thicken the sauce. I like to make the cookies on the same day I stick the roast in the fridge. That way they're good and crunchy and we can snack on the rest throughout the week. Place the meat in a large, resealable bag. In a saucepan combine the vinegar, wine, onion, carrot, celery, garlic, salt, parsley, bay, peppercorns, cloves, and allspice. Heat gently, stirring until the mixture just bubbles. Remove from the heat and steep for 10 minutes. Stir in the ice water and pour over the meat in the bag. Place the meat in the refrigerator to marinate for 3 days, turning the meat once or twice a day. While the meat is marinating, make the gingersnaps for the sauce. This is the recipe I use. When ready to cook, remove the meat from the marinade and dry on paper towels. Reserve the marinade. Dredge the meat in the flour and brown in the oil on all sides. Transfer to the slow cooker. Pour the marinade into the pan bring to a simmer, scraping the bits from the bottom of the pan. Pour over the meat in the slow cooker. Cover and cook on low for 8 hours. Remove the meat to a serving platter and keep warm. Strain the sauce into a large measuring cup and add enough water or beef broth to make 3 cups. Pour the sauce into a saucepan and whisk in the brown sugar and gingersnap crumbs. Heat, stirring constantly until thickened. Slice the meat and pour over some of the sauce. Serve the remaining sauce at the table. I prefer to make my mashed potatoes in a food mill. I love the creamy fine texture it produces. But my grandfather loved his potatoes lumpy. In fact, he was in charge of mashing them so he could make them just as he liked. So, for him, I make these lumpy. Just the way I remember. Wash and peel the potatoes and turnip. Cut the potatoes into large chunks, cut the turnip into small chunks. Place in a sauce pan with enough salted water to just cover. Bring to a simmer and cook for 10 minutes or until soft. Drain and rinse the pan. Place the pan back on the heat and add the butter and milk. Heat until the milk is steaming and the butter is melted. Add the cooked potatoes and turnip and mash by hand. If the mixture is too dry add a splash more milk. Taste for seasoning and add more salt and pepper if needed. 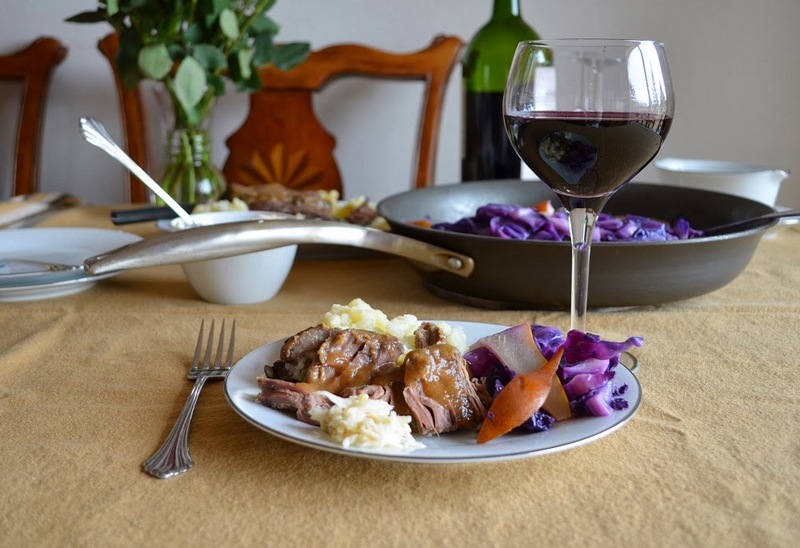 Serve with the Sauerbraten and its gravy. In my grandmother's recipe box I found a card about horseradish. It said, "To those who know it well, horseradish is more than a spice. It is a tonic and friend, sure to freshen the senses and brighten the eyes." I'm sure this is true, as my grandfather had a twinkle in his eyes that was brighter than the stars in the night sky. Peel the rough, brown skin from the horseradish root and cut it into small chunks. Place it in the bowl of a food processor and pour in enough vinegar to come half way up the horseradish. Add equal amounts of sugar and salt to taste (I use approx 1/2 tsp of each for a 6 - 8 inch piece of horseradish.) Process until finely chopped but not milky. There was a bosc pear tree growing in my grandparent's garden. 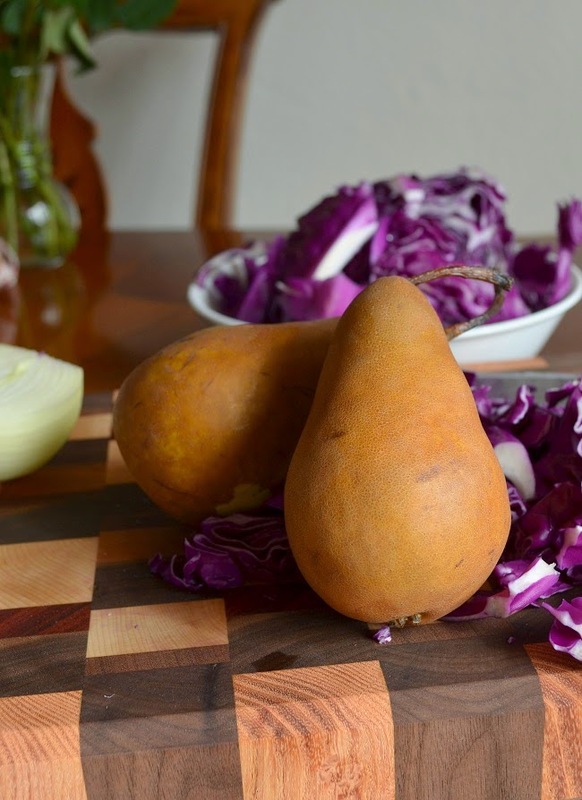 It didn't produce much, growing in our harsh, dry climate, but the pears it did produce were sweet and tender, the result of a lot of hard work on the part of the tree. My grandmother made this with cabbage and pears straight from her garden. Melt the butter in a large skillet over medium-low heat. Add the onions and a large pinch of salt. Cook until they just begin to soften (3 - 4 minutes). Don't let the butter or onions burn. Add the cabbage and another pinch of salt. Cover and cook for 10 minutes, stirring occasionally. Stir in the pears, sugar and vinegar. Cover and cook until the pears are just soft, 3 - 4 more minutes. Taste for seasoning and add additional salt if necessary. Beautifully written, it made me think of my own grandfather. Thank you for sharing your stories.